Truly we have seen some impressive motherboards with Intel’s Haswell line of processors with some matching the likes of the high-end X79 chipset based products. ASRock, today unleashes their own behemoth known as the Z87 Extreme11/ac which is truly a flagship motherboard entry based upon the Z87 chipset. This ASRock Z87 Extreme11/ac is an E-ATX form factor motherboard and the only competitors i can think of are either the MSI Z87 XPower and Gigabyte’s Z87-X OC Force which are packed with handful of power for enthusiast and overclockers. 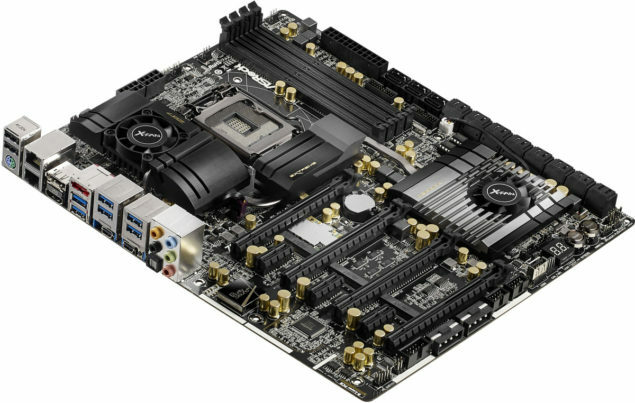 The Z87 Extreme11/ac is one step ahead of these boards with exclusive A-Style features and a powerful VRM design which is detailed briefly below. 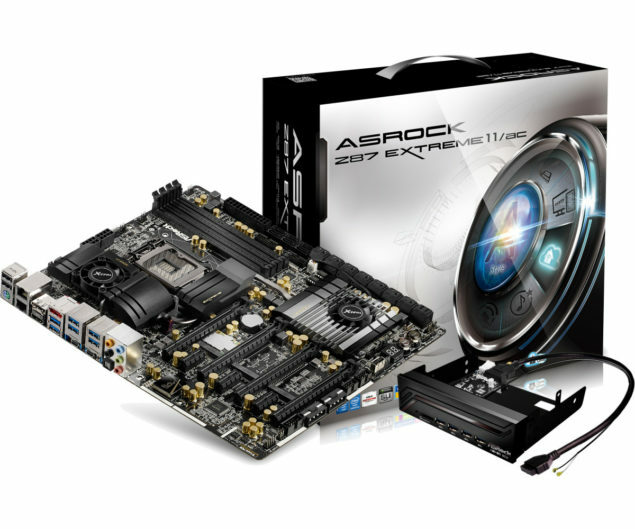 On the technical side, the ASRock Z87 Extreme11/ac features a 12 Phase VRM fitted with top of the line ASRock A-Style features and components. The LGA1150 socket is supplied power through dual 8-Pin connectors which allow for LN2 overclocking and offer vastly greater stability. You can note that the Z87 Extreme11/ac has a large active cooling in place interconnected via a heatpipe that runs the entire length of the board. Each. Heatsinks located at the PCH and PWM supply are actively cooled by two small fans that ensure that the board stays cool under load. The motherboard comes with a large variety of ports, starting with the storage options which include 22 SATA 6 GB/S ports and 3 SATA 3 GB/s ports. This is by far the largest amount of connectors ever featured on any Z87 motherboard. If that’s not enough, the motherboard also offers three m-SATA ports, one of which is occupied by the 802.11 b/g/n Wi-Fi module while the other two can be equipped with any add on card or m-SATA SSDs. The PCH heatsink is quiet large and could hold a PLX chipset to offer more PCI-e lanes to the four 3.0 x16 expansion slots that offer quad-way SLI and CrossFireX Support. The motherboard also comes with three PCI-e 3.0 x1 slots. For sound the Z87 Extreme11/ac has been equipped with the A-Style Purity Sound chip that offers top of the line quality audio through the 8.1 channel jack. The motherboard comes in the XL-ATX for factor and is fully loaded for enthusiasts and overclockers. Press Release – TAIPEI, Taiwan, November 18, 2013 – Amid the heaps of Z87 chipset motherboards which have already been around for a while, there can only be one that rises from the top with its delicacy and perfection. The long wait has ended, here comes the king of all Intel 8 Series motherboards. 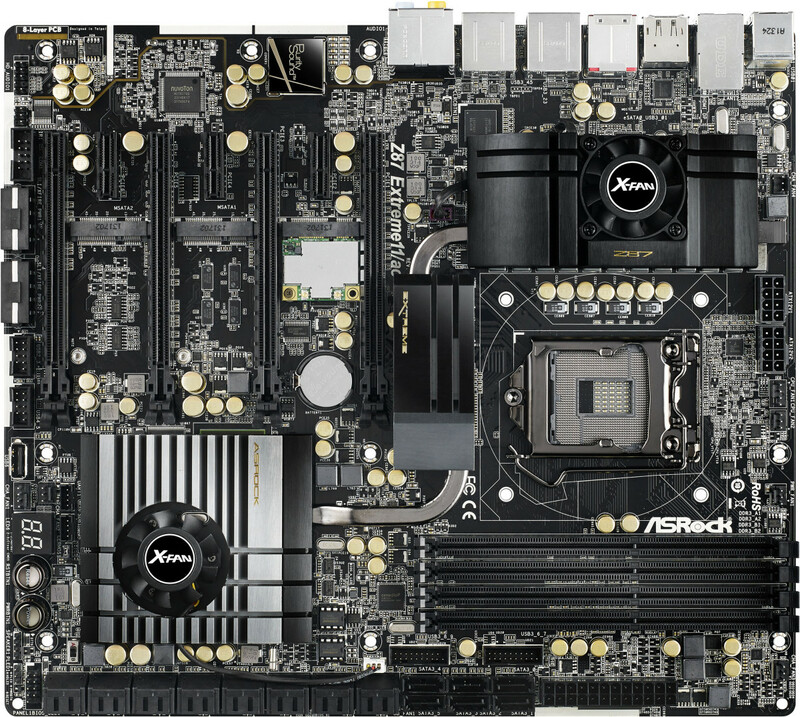 All hail ASRock Z87 Extreme11/ac, the most high end Z87 motherboard on the face of earth! Using out of the world to describe ASRock’s flagship motherboard Z87 Extreme11/ac is actually an understatement. This motherboard boasts a whopping 22 SATA3 ports, including 6 SATA3 ports by Intel® Z87 chipset, and another 16 SAS-3 12.0 Gb/s ports from the added LSI™ SAS 3008 Controller plus 3X24R Expander, which can reach up to an unearthly 6.1 GB/s transfer speed! Like every other tiny detail on this motherboard, Intel Thunderbolt™ technology also gets a facelift! This time ASRock Z87 Extreme 11/ac is armed with Thunderbolt™ 2 for up to 20 Gbps high speed data transferring. Besides Daisy Chain which allows the connection of 12 Thunderbolt devices, users may also connect their graphics card to ASRock’s exclusive DP-In port on the motherboard using a mini-DP to DP cable, and link Thunderbolt™ devices and monitors with a Thunderbolt™ cable to get extreme performance of the graphics card via Thunderbolt™ technology!